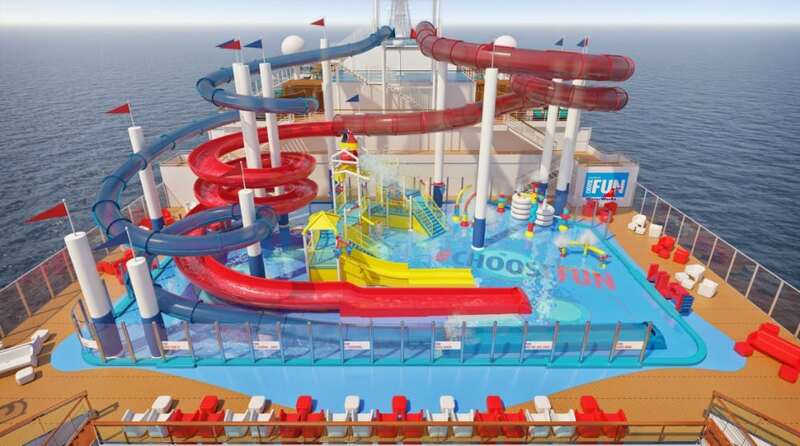 The water park that will be featured on the new Carnival cruise ship Carnival Panorama has been unveiled. The cruise line’s chief fun officer and NBA Hall of Famer Shaquille O-Neal revealed the plans during a fun video press conference which we’ve included further below. Named as the Choose Fun Park, it will feature two massive water slides. The 455-foot-long Red Fun slide and the 300-foot-long Blue Fun slide will offer guests a thrill at sea. 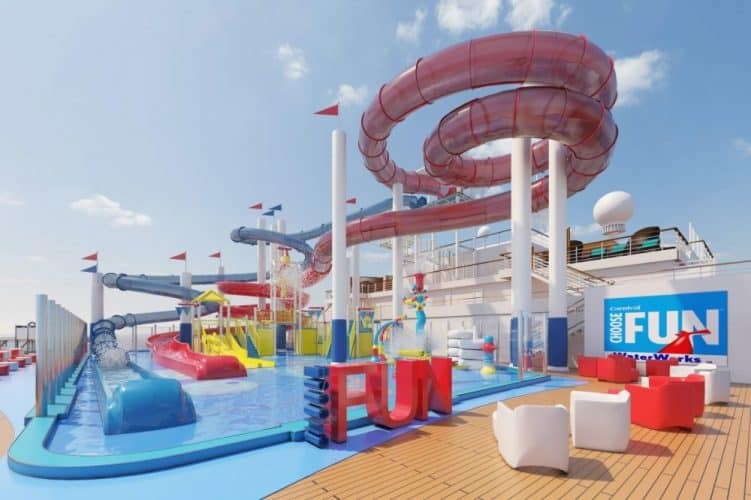 Also included at the park located on the top deck is a 300-gallon PowerDrencher tipping bucket, kiddie spray park along with the nearby SkyRide which can already be found on Carnival Vista on Carnival Horizon and SportsSquare. The water park will be featured on the third Vista-class Carnival ship when she arrives this December on the U.S. west coast. The ship will sail her three-day inaugural voyage from Long Beach, California on December 11, 2019, before launching year-round seven-day cruises to the Mexican Riviera on December 14, 2019. The week-long cruises include calls at Mazatlan, Cabo San Lucas, and the popular Puerto Vallarta. Click here for our guide on things to do in Puerto Vallarta. The new vessel will also be featuring the first Sky Zone trampoline park at sea. It will be a 3,000 square foot two-deck facility providing a 12-lane trampoline court. Other highlights include Guy’s dedicated Pig and Anchor BBQ venue along with an onboard brewery and the popular SkyRide where guest can peddle slow or fast elevated above the top open deck providing stunning ocean views. 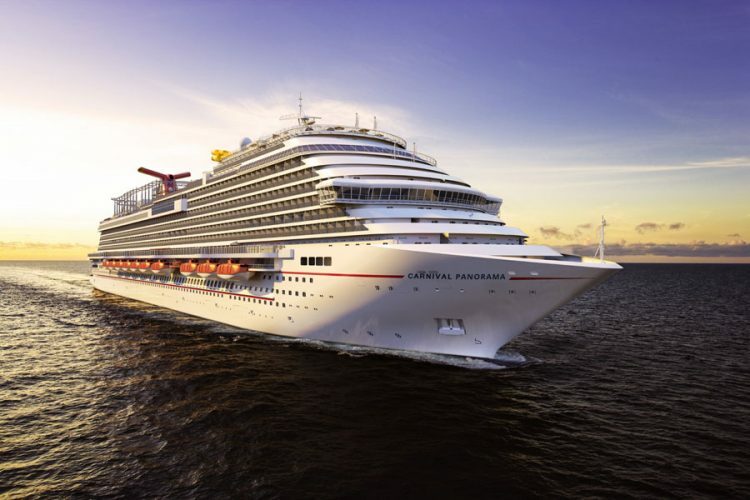 Carnival Panorama is currently under construction by Italian shipbuilder Fincantieri in Italy and she will be the first new Carnival ship on the west coast in 20 years. Once completed the ship will be 133,500 gross tons with a guest capacity of over 3,900 at double occupancy.